Paracord bracelets are a trending fashion accessory among outdoor enthusiasts and preppers alike and although they do come with different patterns and overall design, some will try to find another way to bring their paracords along with their other every day carry or EDC gears. 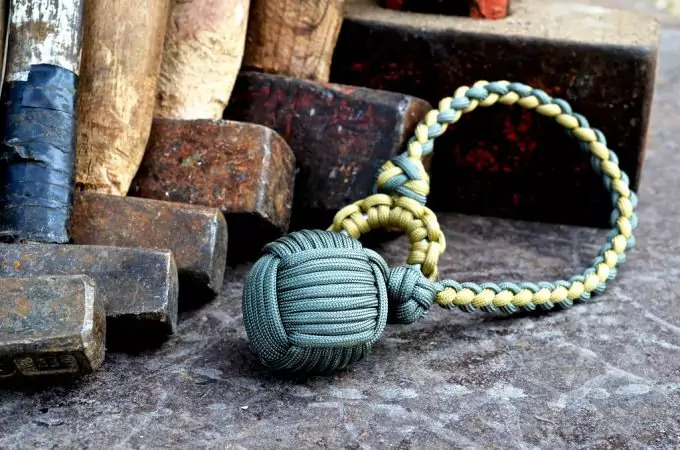 A few enterprising individuals have come up with lanyards, anklets, necklaces and whatnot but among these new incarnations of the paracord bracelet is the paracord keychain. Keychains, or key fobs in other countries, are handy when it comes to locating your keys or looping similar mementos in. They can be attached to a bag at the start of the zipper or it can be attached to your carabineer and then attached to your belt loop. 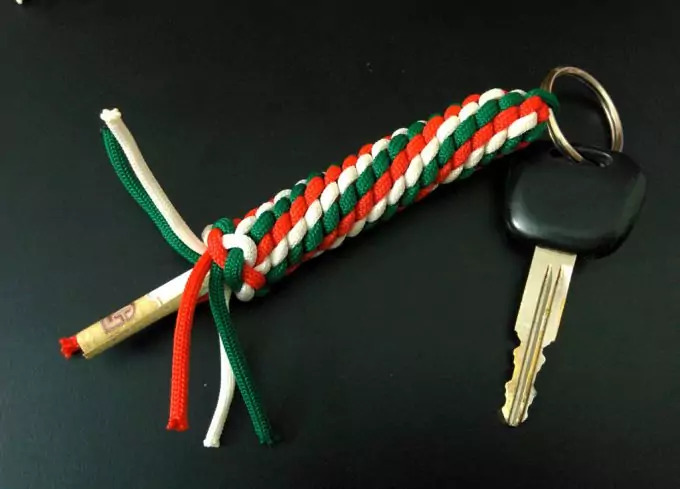 Keychains have a variety of other uses other than holding keys and this applies to paracord keychains. 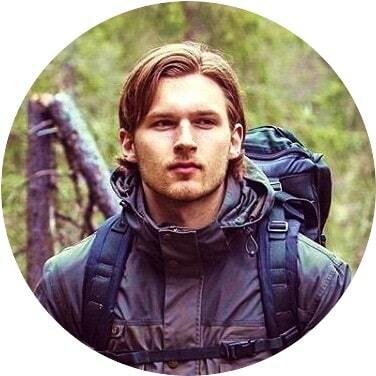 There are possibly a thousand and one paracord projects out there that you can make and given the strength of the paracord, the purpose and size of these projects is also quite expansive. 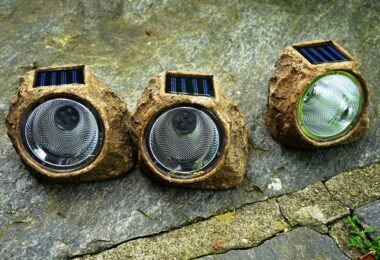 The list can of course continue, and if you want to see more and instructions for each project, please take a look at our paracord projects article. But, out of the multitude of projects, today we will stick with keychains. Paracord bracelets involve basic loops and knots and you can sometimes squeeze in an added feature or two. This goes the same for keychains, you can have monkey balls, hidden compartments, and you can even shape your keychain into a grenade or a cross. Crafting your own paracord keychain is quite easy and will take a small amount of time to make one. 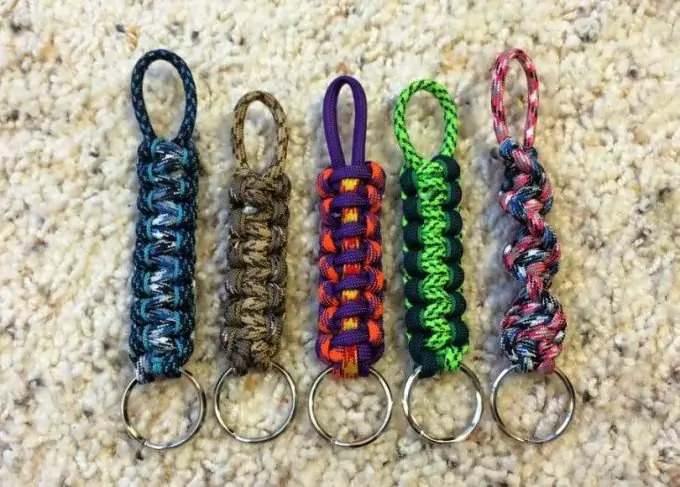 The great value of learning how to make a paracord keychain is that you can mass produce them to give to friends or sell them online or even supply a specialized shop with them. 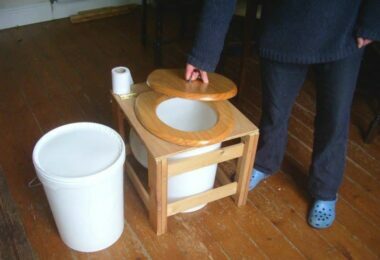 There are several varieties and here are the instructions to make some of them. In making any paracord project, always remember that for every inch of the finished product you want to make, you will need the same length in feet of parachute cord. For example, you would want a 12-inch paracord lanyard, and then you would need 12 feet of parachute cord to cover the entire length. This can still be adjusted depending on the type of weave that you would want to use for your project. The more complex, the longer cord it needs. 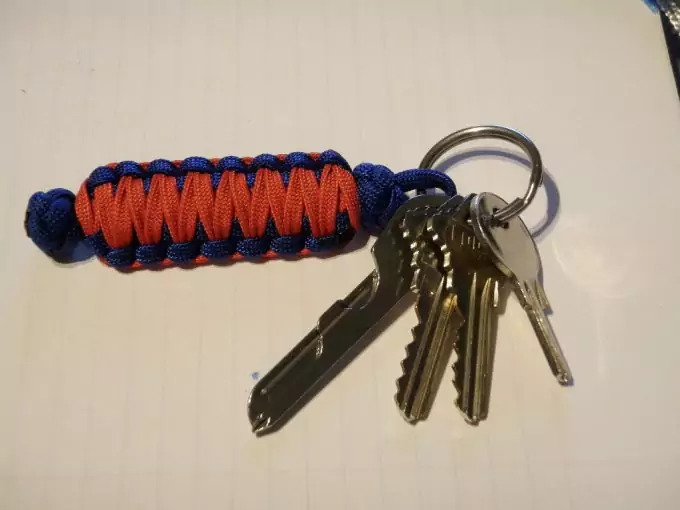 The very basic of all paracord keychains uses a standard cobra weave. That is easy to untangle and can easily hold up to 12 feet of parachute cord. Take your parachute cord and insert one end into the key ring and then pull it through until the midpoint of the paracord is on the key ring. Using the ruler, measure about 6 inches from the key ring and make a mark. This mark will be the starting point for your cobra weave. Starts making your cobra weave by looping one end, usually the right, under the main shaft and under the other cord; loop the left cord over the top of the main shaft and through the loop created by the right cord. Make sure to pull the cords tightly before moving to the next set. Repeat this step until you close in on the key ring. Leave a little space between the key ring and the loops. Cut the excess parachute cords, as close to the loop as possible. Burn off the ends using the lighter until the strands have melted together. This is a stylish version of the first keychain that was discussed. The cobra weave is also called the Solomon Bar. Take your parachute cords and using the lighter, fuse them together on one end. Make a Lark’s Head knot on the smaller carabineer loop using the melted joint as the middle point. Take the loose ends and loop them around the key ring. You can measure the desired length using your ruler at this point. Once you’ve taken the measurements, start making your cobra weave by looping the right cord under the main shaft and under the left cord. Loop the left loop over the main shaft and through the loop created by the right cord. It is important, at this point, to remember that whatever color is on top of your weave should be the same all throughout. Doing otherwise will result in another weave that you will learn later. Pull on the cords tightly to make sure that the keychain weave is compact and will not unravel easily. Repeat step 4 until you close in on the carabineer, leaving a little space in between. This keychain can also serve as a self-defense tool since it can act like a mace when needed. No need to put it spikes though. Take your ball bearing or marbles and super glue one end of the parachute cord on the marble or ball bearing. It doesn’t have to stick that well as long as it can stick long enough to help you start building your knots. Place the ball or marble between your index and middle finger and take the paracord and loop it around your index and middle fingers five times going towards your fingertips. Once the cord is halfway on its fifth loop, extend it a bit around your middle finger then push the ball bearing towards the middle of the two loops that you just made. Using your middle finger as the base point, loop the cord around the ball again, this time passing through the gap created by the ball bearing, effectively wrapping the first set of loops you made earlier. Remove your fingers from the loops and then loop the cord around the space where your fingers were earlier, completing five loops. You should have three non-intersecting loops. Locate the first loop in the first set of loops that you made and tighten them. Repeat this for the remaining two sides. You should have a tightly woven ball or monkey fist after these steps. With the remaining cord, you should be able to make any knot or weave that you want; you can add another color by joining it near where the original cord comes out of the ball and weave away. For this example, the other end is closed by looping the cord towards the end and then wrapping the remainder going towards the monkey fist. 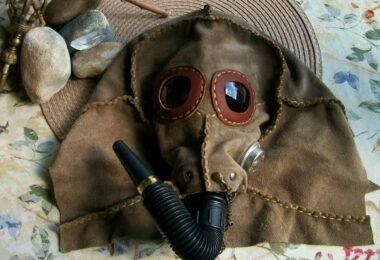 You can also close this project out by attaching a carabineer or a key ring at the other end, or a key ring with a carabineer works fine too. Cut any excess cord and burn off the ends using the lighter until the strands have melted together. The King Cobra is a thicker version of the Cobra Weave keychain. But the added girth also means added length to your parachute cord which can come in handy during emergencies. Find the middle of the cord and mark it with a rubber band or you can go ahead and insert the key ring. Create a Lark’s Head around the key ring and measure how long you want your keychain would be. After you have the measured your desired length, start making your cobra weave as discussed earlier. Once you’re close to the key ring, you can opt to close out the first set of cobras by tying a simple knot or you can add just go ahead and continue. This time, create a cobra weave over the first set of cobra weave that you just made, going the other direction. Make sure to pull the cords every now and then to ensure that the whole keychain is tight. Close out the King Cobra keychain by cutting off the excess rope at the end of external cobra weave and burn off any loose strands using the lighter. This variety of keychain is very useful especially if you have limited space to put in your multitool. Take your paracord and make your standard cobra weave, using the key ring or carabineer as the mid or anchor point. The cobra weave will act as the main structure of the pouch. To check if you have the correct length of cobra weave, take your multitool and wrap the cobra weave around it, once you are able to enclose the multitool around it, then you have the right length of cobra weave. Make sure that you allow a little excess weave that will serve as the opening. With your multitool still wrapped around the cobra weave, weave through the outer loops of the cobra weave using a fid. Use a standard in and out pattern for each side. There should be two loose ends after you finish your cobra weave and you should be able to use both for their respective sides. Once you are done weaving the ends in and out of the sides, pull on the weave to tighten them accordingly. Another stylish variety of the parachute cord, this is easy to unravel as well. To start making the DNA keychain, put the paracord through the key ring or carabineer and find the middle point. Once you have the middle point, measure the desired length of your keychain and mark the place with a rubber band or string. 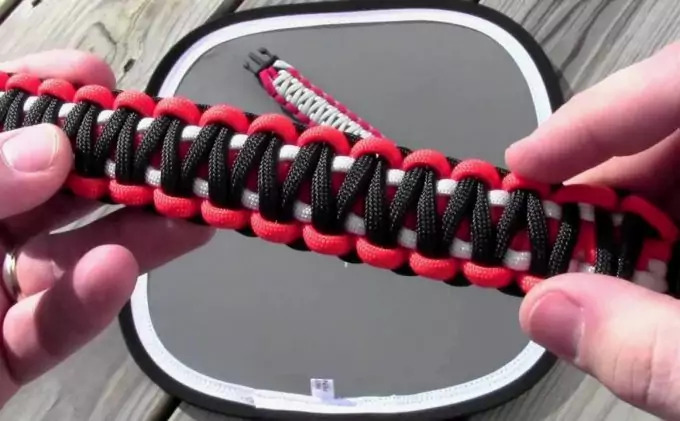 The first step in making the DNA weave is similar to a cobra weave. The difference starts on the next weave where instead of maintaining the same side or color throughout the weave, you alternate the colors or sides by bringing the cord underneath to the top and vice versa. Repeat the process until you get to about half an inch near the key ring or carabineer. Close out the keychain by cutting off any excess rope at the end of and burn off any loose strands using the lighter. A thicker and shapelier version of the King Cobra and the Cobra weaves, other variants of the grenade paracord keychain includes a hand sanitizer in the middle, earning the moniker, Germ Grenade among enthusiasts. 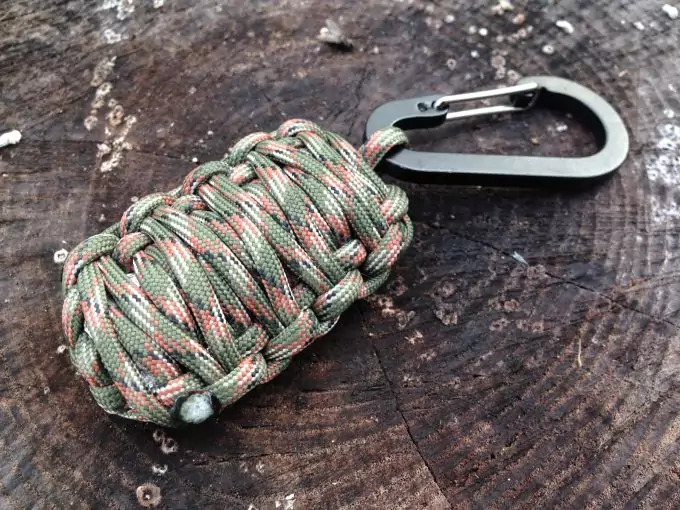 Start off the grenade keychain by locating the middle point and then tying a standard diamond knot. Measure your desired length of keychain and then create your first cobra weave. Repeat the cobra weave until you reach the diamond knot at the end. Once you’re done with the first cobra weave, do another one over the first, like how you would do it for a King Cobra weave. After you’ve finished the second layer, turn it over and do a third cobra weave and a fourth. Like all other keychains, snip off any excess parachute cord and burn any loose strands until they melt. 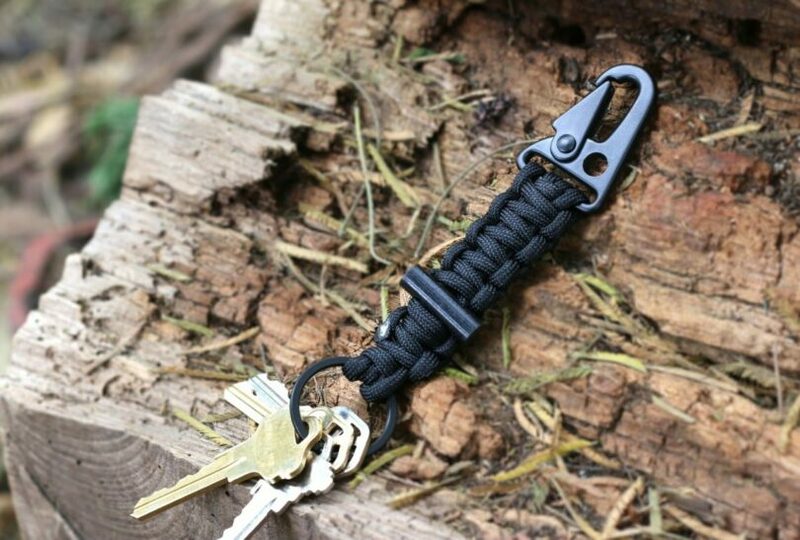 Probably one of the coolest paracord keychain projects out there. This includes a secret compartment where you can stash pen knives, small pens, even cash. Take two strands of your paracord and intersect them in the middle to form a cross. From this point on C1 will refer to the horizontal cord, C2 will refer to the vertical cord and C3 will refer to the third cord that you will use in a bit. Form an S shape using C1. It needs to go over C2 then under and then over again. Weave top portion of C2 should go over C1’s top loop then under the bottom loop of the S you made with C1. Using the other end of C2, weave it over C1’s bottom loop and then under the top loop of the S shape. Pull the cords to tighten the knot but keep it a little loose for the next step. Take C3 and insert it into the S shape created by C1, going under both the top and bottom and over the middle section. Pull C3 until you reach the middle point. Pull C1 and C2 again to tighten the first knot. Spread out all strands like six-legged starfish. At this point, the right end of C1 will be C1R, and so on. The left end of C1 will then be referred to as C1L and so on. Take C3R and cross it down and over C1R, then take C1R and cross it over C2R, repeat the process until all strands have crossed down and over the own adjacent to it. Pull all cords to tighten the knot. This knot is called the closed crown knot. To make the secret compartment, complete four to five of the crown knots and then insert a pencil in the middle of the knots, make sure that the pencil sits on top of the very first knot. Continue weaving the crown knots around the pencil until you have reached the desired length. Close off the crown knots using a diamond knot. Grab any of the strands and put it under and through the next loop in the series. Pull it and repeat the process for all the remaining strands. Pull the strands to tighten the knot just enough to keep them all together before removing the pencil. 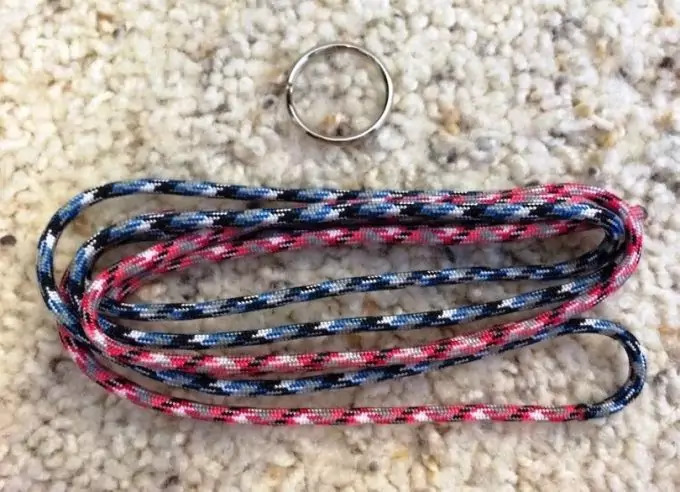 You can opt to retain the excess length of parachute cord to serve as a design feature or you can cut it clean one each after the diamond knots and then burn off the strands until they melt. As you can see, paracord keychains can take many forms and weaves can be interchanged and even mixed together to come up with a unique design. However, in order to make all these projects, you will need to know the basic knots and how to work from there to the more advanced ones. We have a great piece on paracord knots that you should check out if you want to learn more. 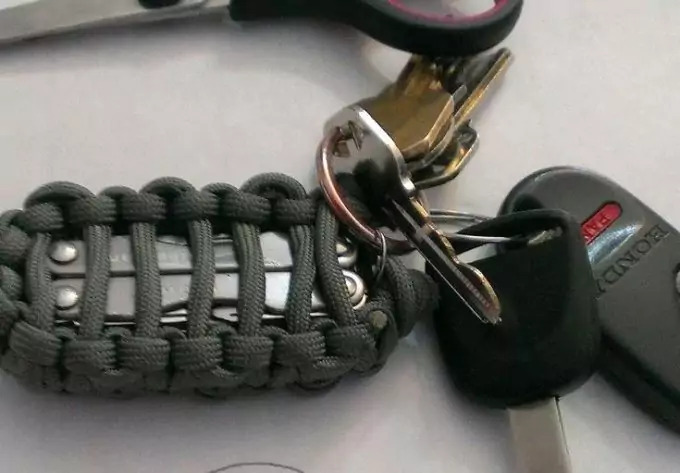 Like many survival tools, paracord keychains need proper maintenance to make them last and any defect seen should be scrutinized to determine if the keychain should still be used in emergency situations or not.